These types of sealers can be hand-held, semi-automatic, or automatic. A plastic clip is a device used to hold bags closed, such as the type of bag in which sliced bread is commonly packaged. Also commonly called bread tags, bread clips, bread tabs, bread ties, bread ribbons or bread-bag clips, these plastic clips preserve freshness by creating a tight seal. Plastic clips can be on automatic lines, semi-automatic and hand-applied lines. Some plastic clip bag sealers include a coder to print details directly on the clip. Handheld tie bag sealers require a person to put the item to be tie sealed in the front opening, and squeeze a trigger. With some machines, the number of twists the machine gives the tie can be adjusted. Hand-held tie bag sealers can be battery operated. 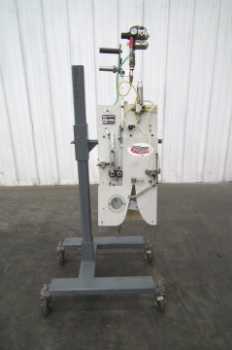 A semi-automatic tie bag sealer is corded and sits on a table top. The operator picks up the bag to be sealed and holds the top together, slides it into the machine and pauses to let it twist the tie on, then removes the bag. A tape bag sealer gathers the opening of the bag and wraps a piece of tape around the bag to form a seal. A staple bag sealer applies a staple to the bag opening.